It's fall, and you can see the leaves piling up in the yard. Using the right tools can make the job of clearing leaves and twigs from the yard easier and faster. What type of tool you use depends on how much money you want to spend on equipment, your own physical capabilities and the time you have to devote to yard work. 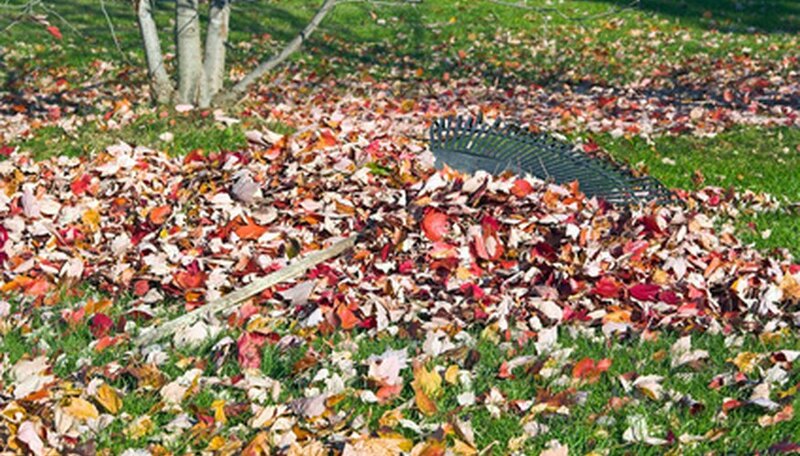 Rakes are probably the most common leaf collection tool. A standard rake, with thin metal tines, will do an adequate job collecting leaves. Rakes will collect small twigs as well, though you may have to spend some time pulling them out from the tines. A fire rake is a tool with three pointy, metal blades that is better for picking up twigs, sticks and branches. It will also collect leaves. Your lawn mower may suffice as a leaf and small twig collecting tool. Remove your mower's bag and mulch leaves directly onto the lawn. Or keep the bag on and collect leaves to decompose in your compost pile for use as mulch the following spring. Be careful when mowing twigs and branches, as they may cause damage to your mower's blade or break apart and strike you. If you are using a mower to pick up your leaves, it is best to remove as many twigs and branches as you can beforehand. Lawn vacuums attach to riding lawn mowers. They can collect large amounts of lawn debris, including leaves and twigs, in a bag that you can empty into your compost pile or at the edge of your property. Lawn vacuums are expensive and can cost you between $1,000 and $2,000. However, they will also save you time and considerable wear on your body. They are ideal for large lawns or acreage where using a rake would be impractical. Leaf blowers can speed up the process of pushing leaves into a pile. Blowers are typically hand held and either electric or gas fueled. Once you have blown your leaves into a pile, remember you will still have to pick them up. A tarp makes a good collector. Pile leaves into the center of the tarp and then drag it to your disposal or compost site. Lawn sweepers are similar in design to push lawn mowers, only instead of cutting grass they collect leaves. A bag is attached to the sweeper and leaves are deposited directly into it. They are cheaper than a lawn vacuum, but do require your physical strength to push. The lack of gas required to use a lawn sweeper, however, also makes it an eco-friendly yard tool.